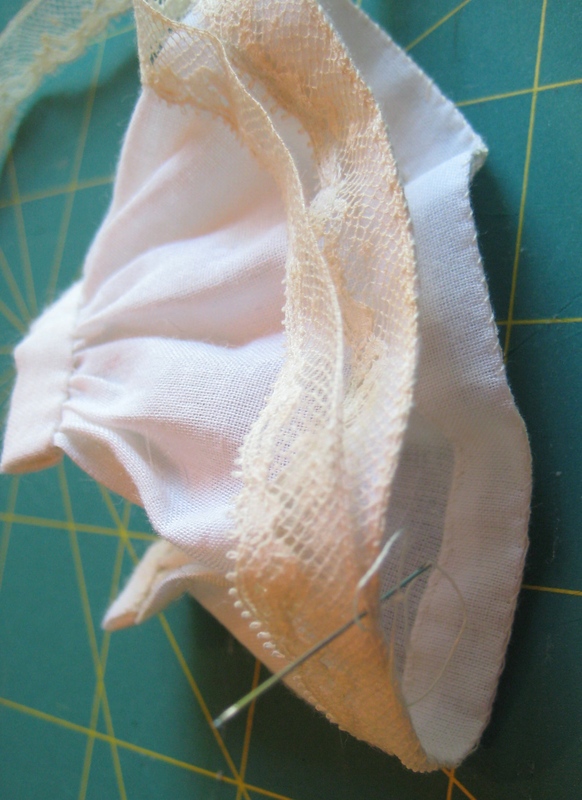 Now it’s time to gather the top edge of the slip, attach a waistband, sew lace to the bottom edge (optional) and add a drawstring. 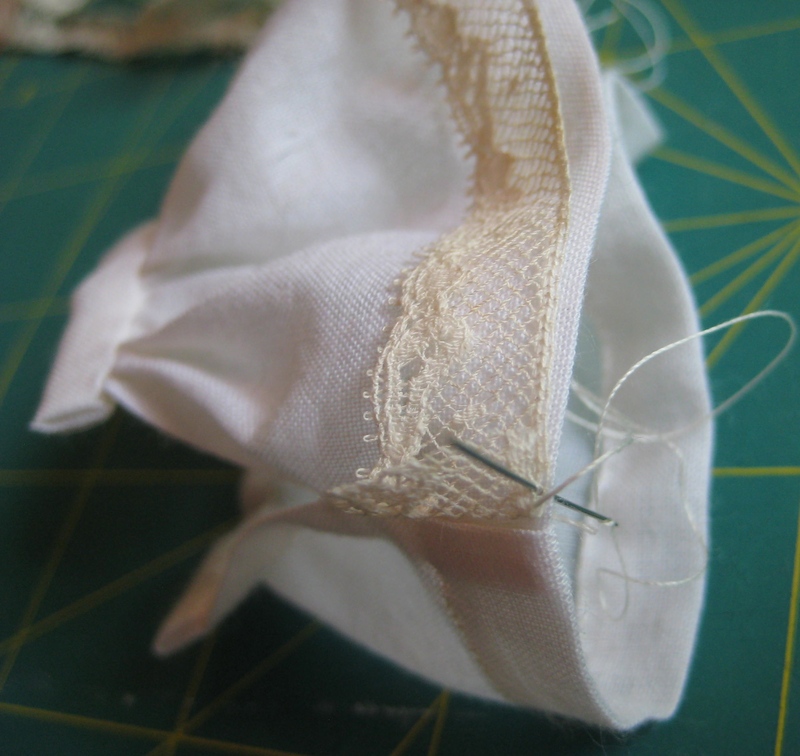 To gather the top edge, I thread my needle with a length of thread that is longer than twice the circumference of my slip. 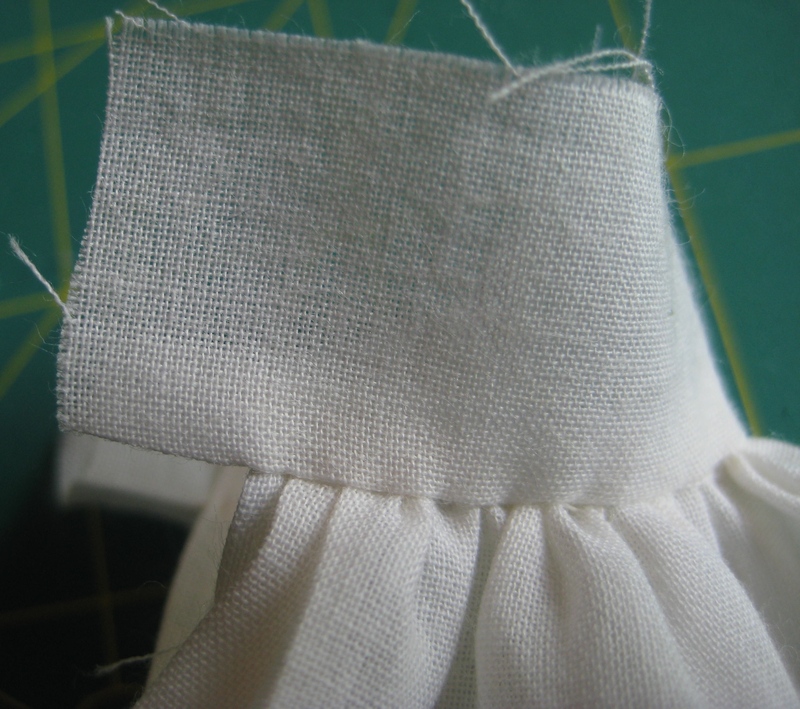 I will be sewing two lines of gathering threads all the way around the top edge. 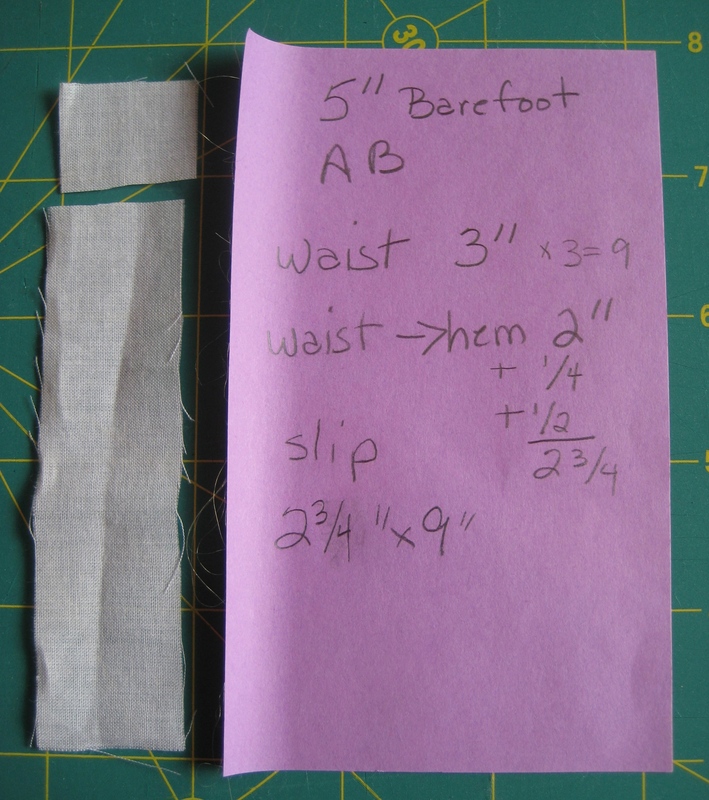 Begin sewing just beyond the fold back and 1/4″ from the top edge of the slip. Take longer stitches (but no longer than 1/8″) all around the top edge. Sew all around until you reach the other fold back. 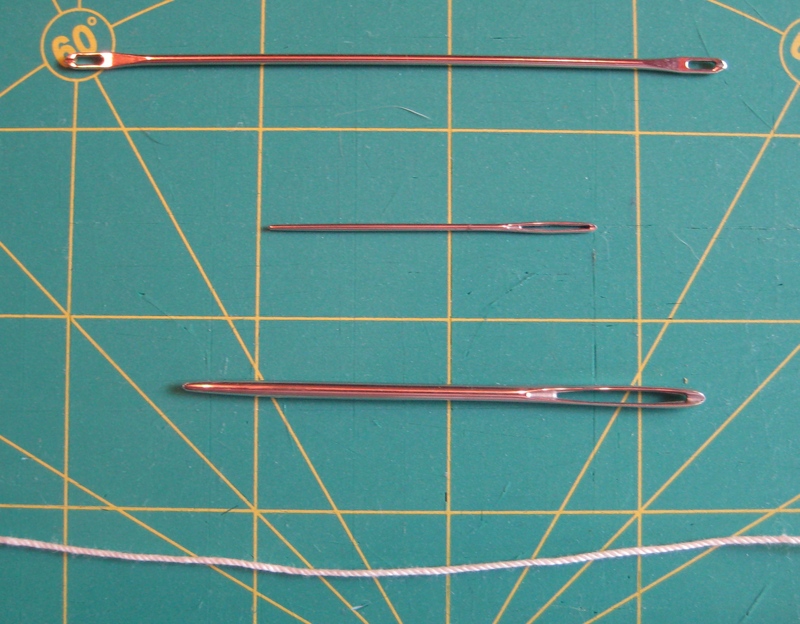 Take one stitch, perpendicular to your previous stitches, toward the top edge. Then sew back around the top, just above (but not crossing) your previous stitches. 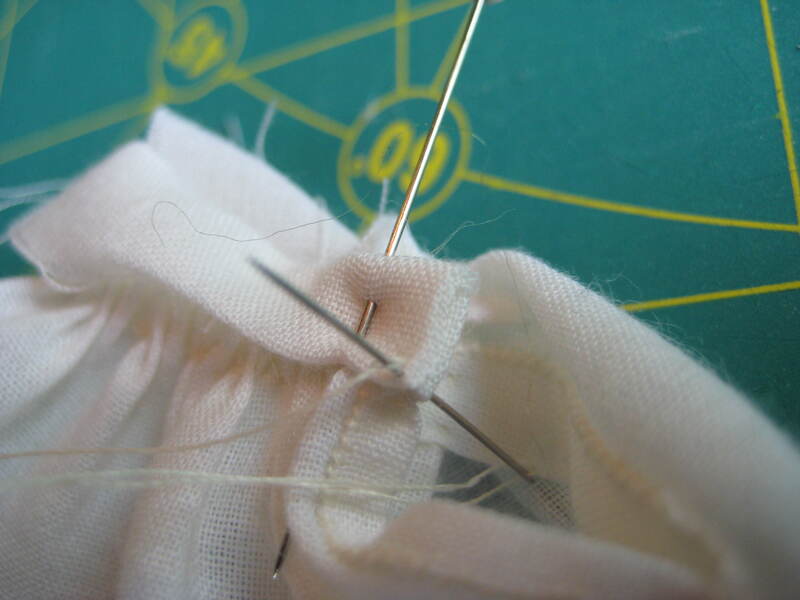 When you get back to the beginning, remove your needle, leaving a long tail of thread. When I cut my waistband, it was longer than I needed. 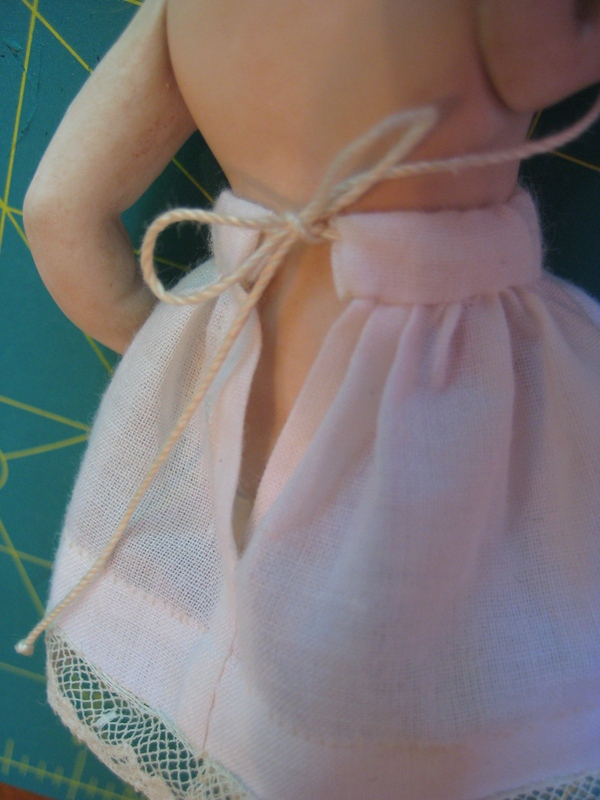 So I now shorten it to my doll’s waist measurement, plus 3/4″. 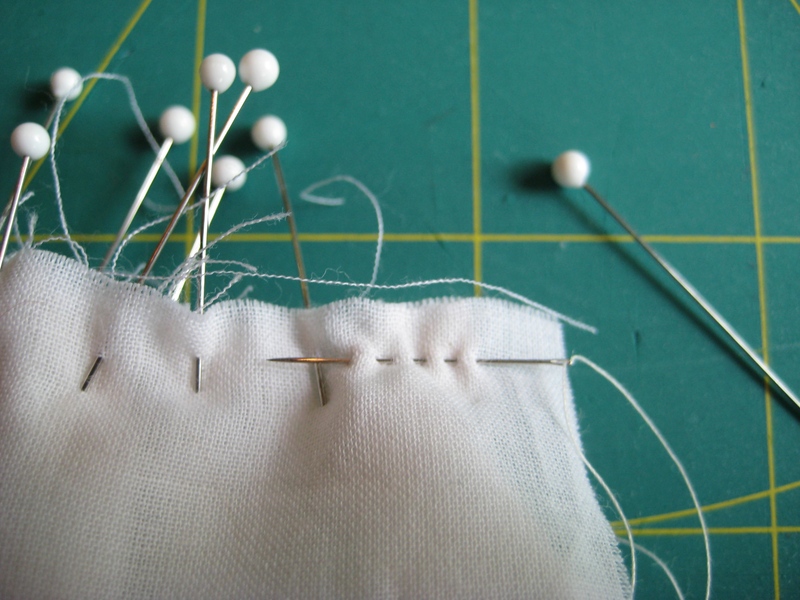 Fold the slip and waistband in half and mark the center fronts with pins. 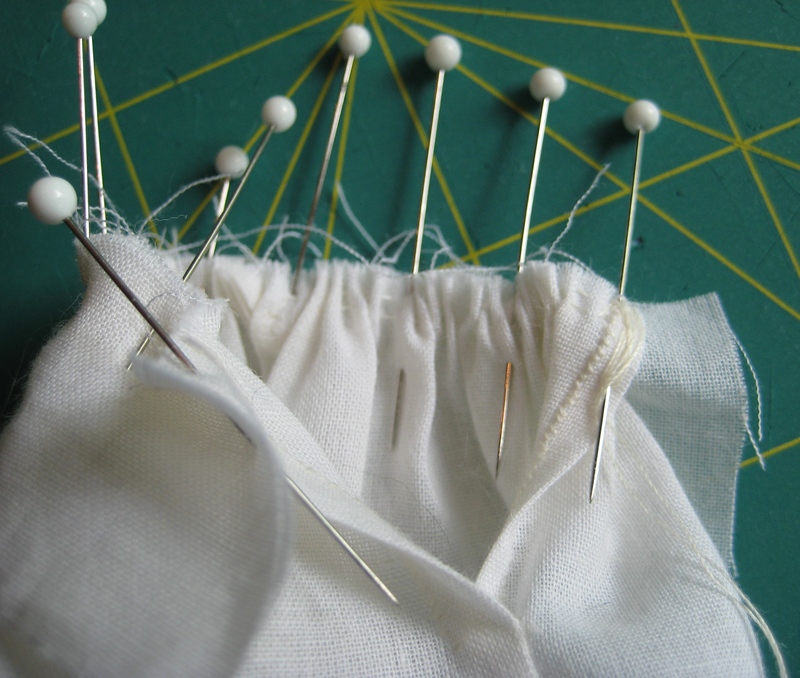 Place the waistband on the outside of the slip, matching centers and pin together with one pin. Working from inside the slip, pin one end of the waistband to the back edge, leaving 1/4 of the waistband free. 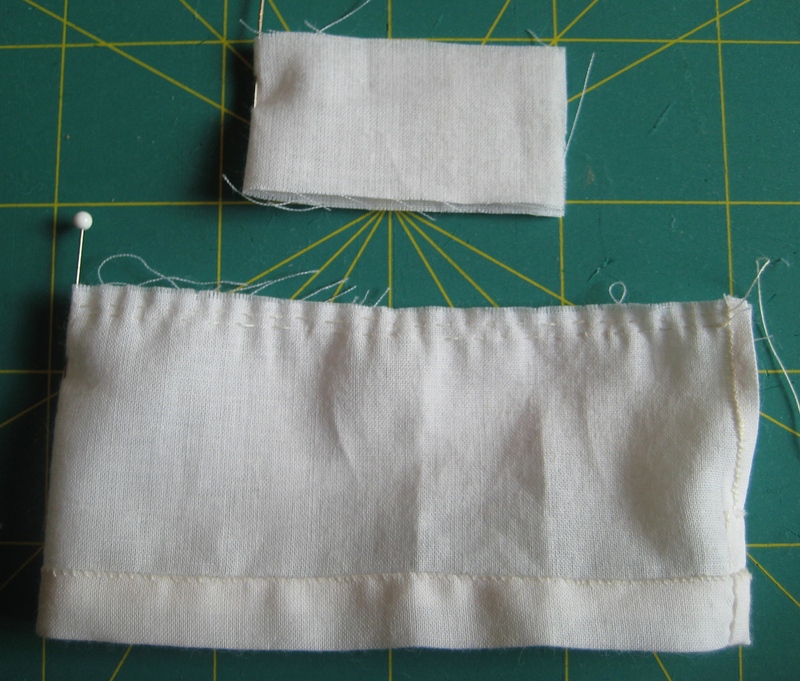 Pull both gathering threads to fit your slip to the waistband. Pin it so that the gathers are spaced evenly. 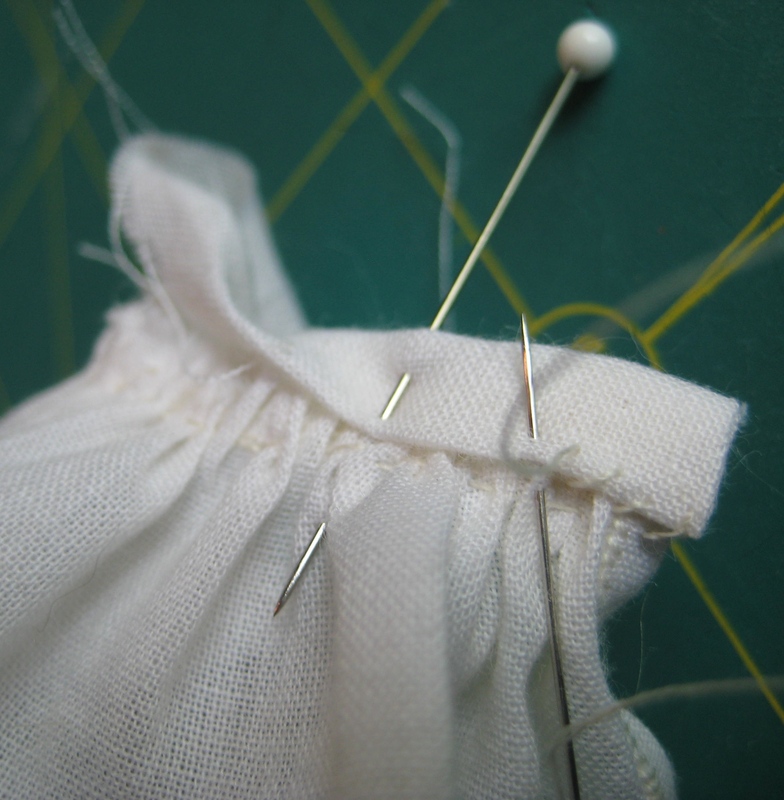 Wrap the long ends of the threads around your last pin to hold the gathers. Begin stitching at the edge of your slip fold back. Stitch from the waistband side, keeping your gathers smooth on the inside. Remove the pins as you go. 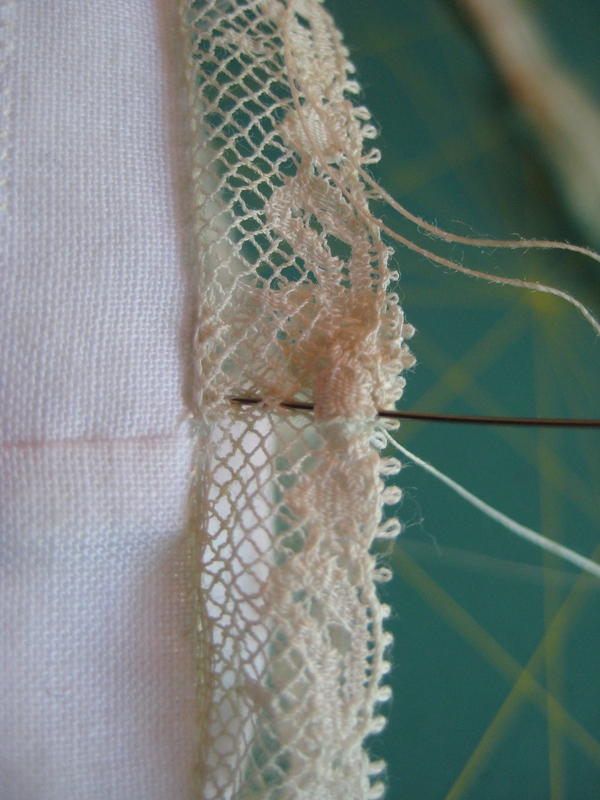 Make sure your stitches are just below the gathering threads so that you don’t have to remove the gathering threads later. 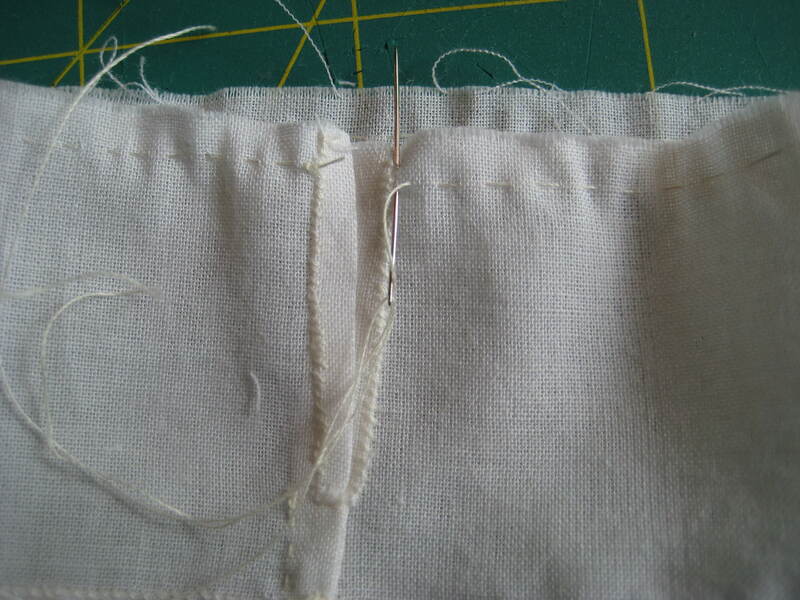 Stitch all around the waistband, then press the waistband up. 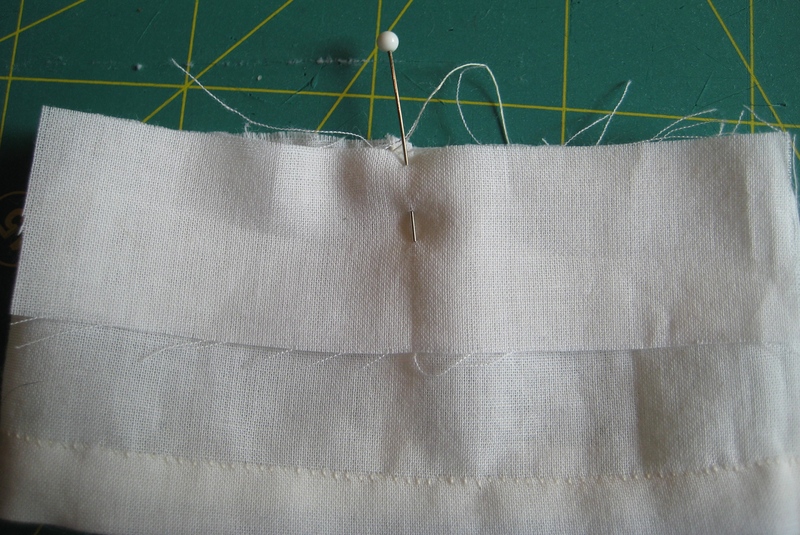 When you are pressing, make sure all the edges are pressed up, toward the waistband. 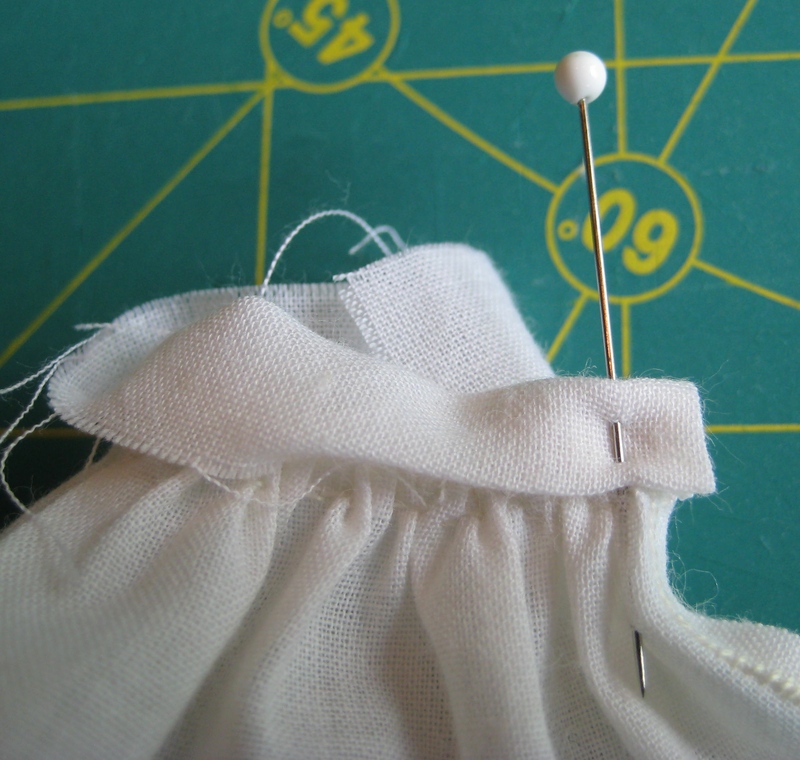 Fold the short end of the waistband back, even with the edge of the slip and pin it. Fold the top edge of the waistband down twice and pin so that the folded edge is even with the stitches that attach the waistband to the slip. 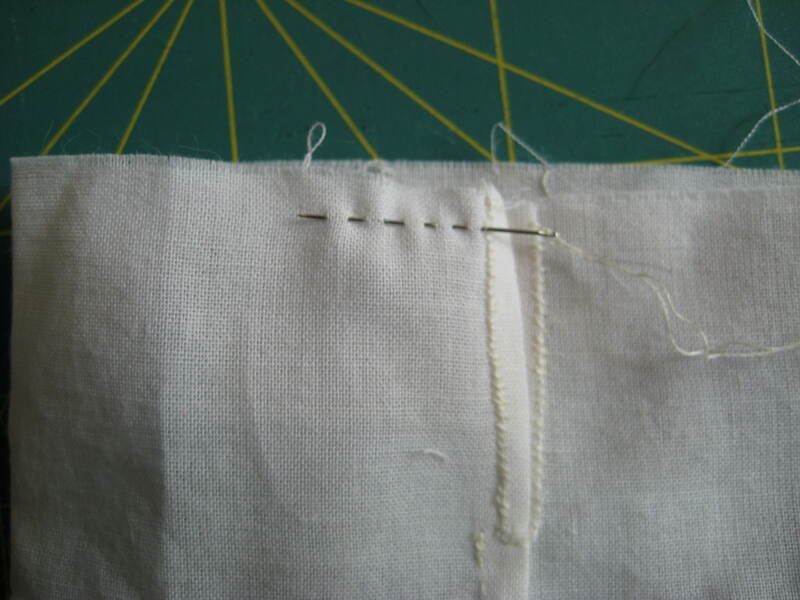 Begin stitching by taking a stitch through the bottom edges of the waistband. Leave the folded ends unstitched. This is how we’ll insert the drawstring. 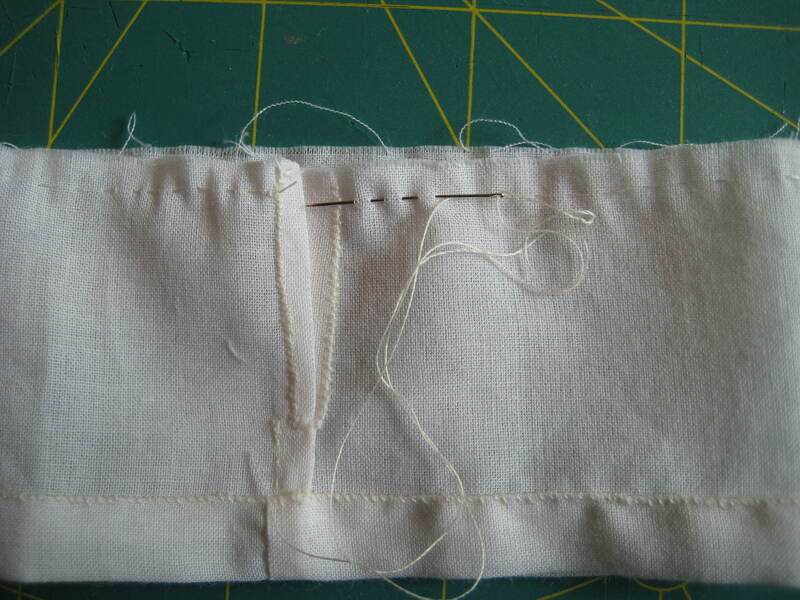 Stitch the inside folded edge of the waistband to the stitching line of the slip. I usually fold and pin as I go. Stitch all the way around. To make it easier to insert the drawstring, do not iron the waistband flat. If you are using lace, now is the time to attach it. Did you know that lace has a right and wrong side? In the picture above, the bottom one is the right side. 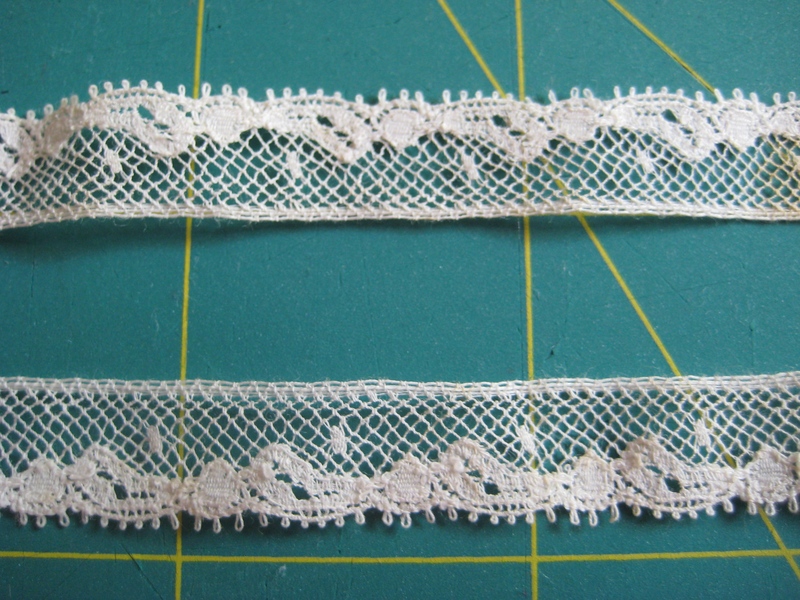 The pattern on the lace is slightly raised on the right side and flatter on the reverse side. This is picky, I know. If you don’t want to worry with it, or can’t tell the right side (it is very subtle), your slip will still look great. No one will know, except you. 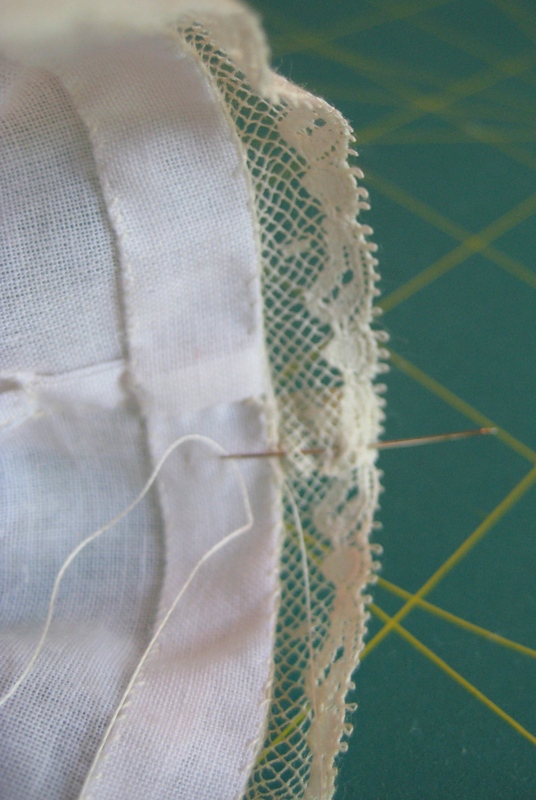 Turn under about 1/4″ of the lace and place it at the back seam with the straight edge of the lace lined up with the bottom edge of the slip. The right side of the lace faces the right side of the slip. Stitch by just catching the hem fold and the edge of the lace in each stitch. Stitch all around until the lace overlaps. 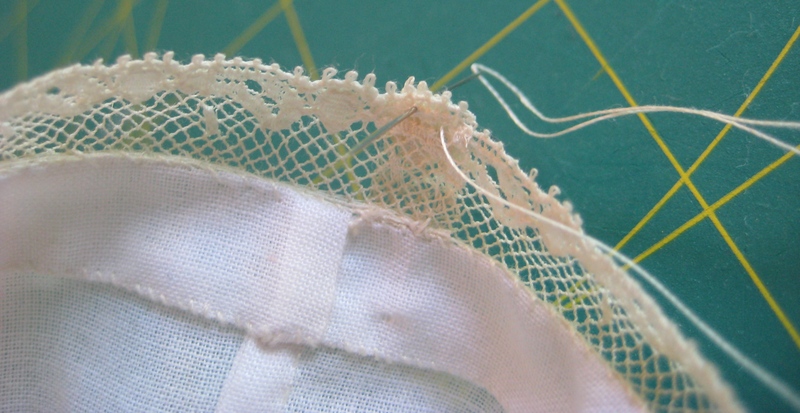 Trim the lace so that the cut edges are even. 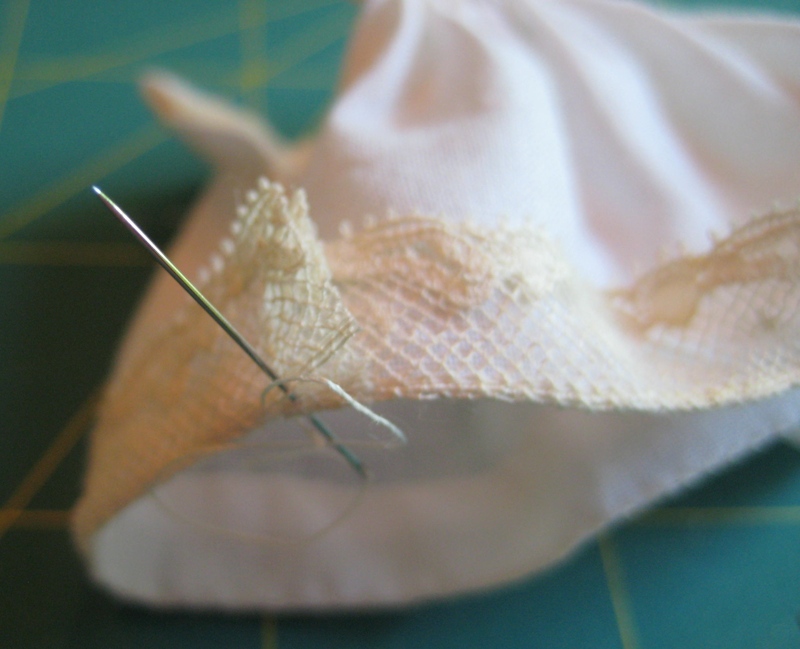 Fold the lace out, away from the slip, and from the inside, stitch the cut ends together. Whip stitch the edges of the lace together. 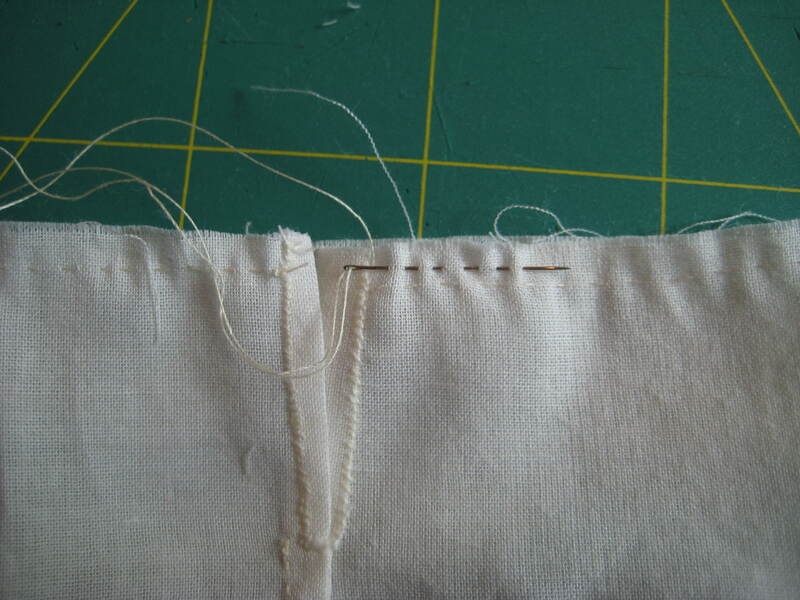 From the outside, stitch the folded edge down. 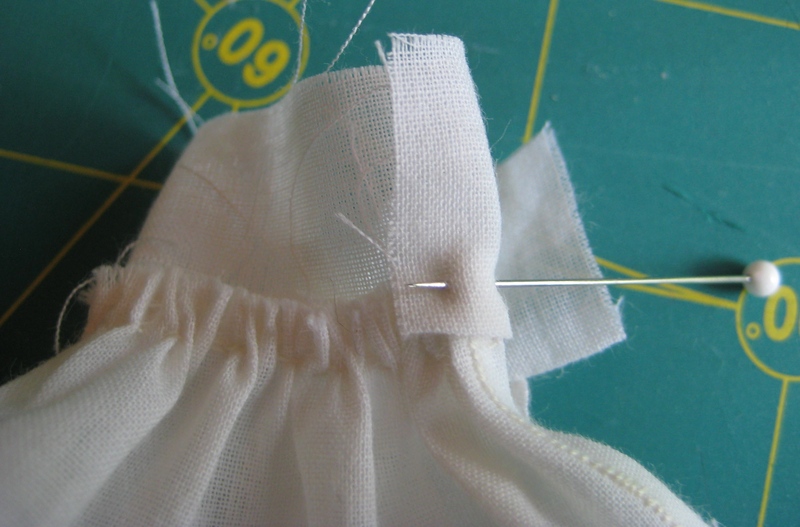 End with a few backstitches inside the hem edge and snip your thread. 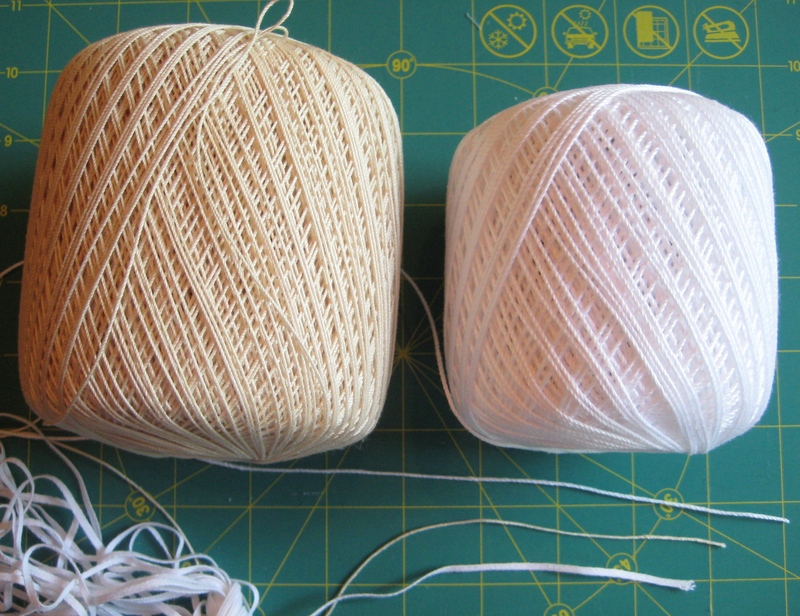 For a drawstring, you can use crochet cotton, thin cotton twill tape or silk ribbon. Crochet cotton comes in different thicknesses and colors. I am going to use the off-white crochet cotton. 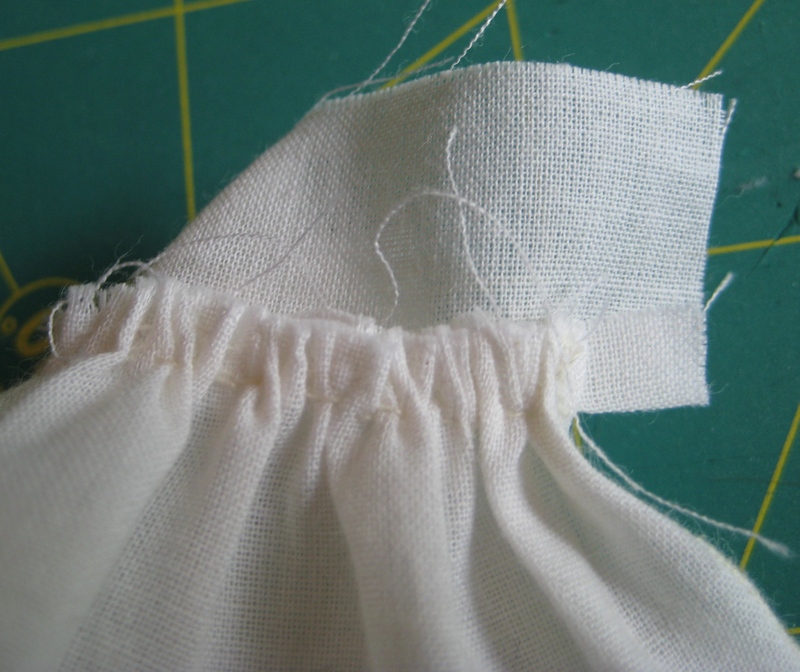 To thread the drawstring through the waistband, you need a needle or bodkin (top of the picture) with an eye large enough to fit the thread or tape. It should have a dull point. If you only have a sharp needle, just turn it around and push the eye through instead of the point. 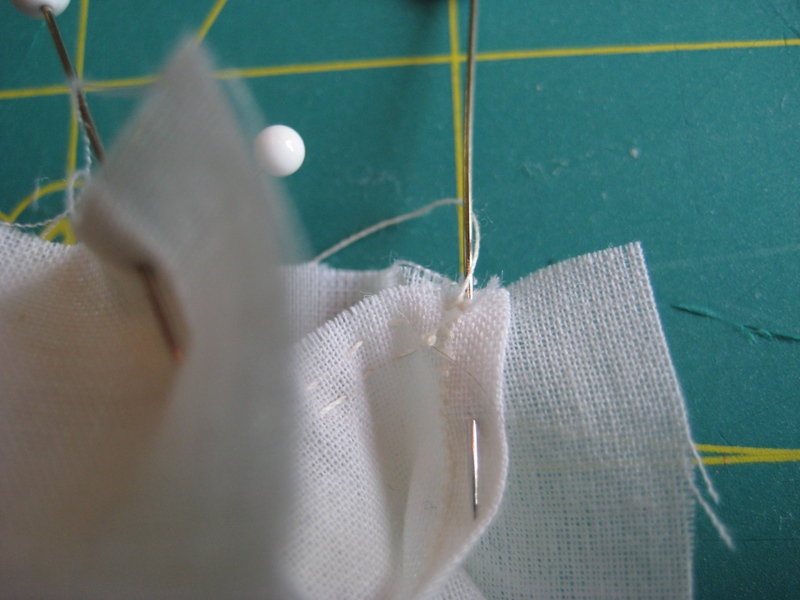 Thread your needle or bodkin with a long piece of thread or ribbon and work it through the waistband opening. The last bit can be tricky and take a bit of wiggling to get it through the opening without catching the fold. Tie it on your doll and trim the ends. I tie knots near the end of the thread to keep it from fraying. There will be a gap at the back of the slip since it cannot overlap. Don’t worry. 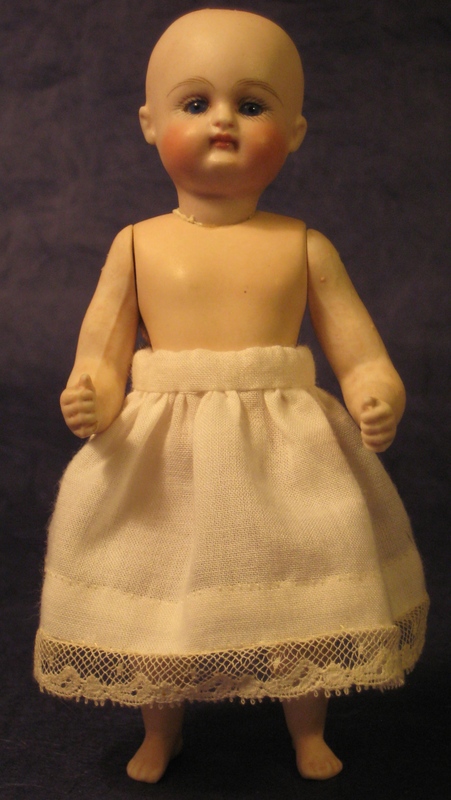 Your doll will rarely be viewed from the back wearing only her slip. Here’s my doll with her new slip. If I decide later that it’s too long, I might add some tucks to shorten it. I’d rather it be a bit long, because if it was too short I couldn’t do anything about it. Next time, we’ll complete the underwear using many of the techniques and stitches you learned on the slip.